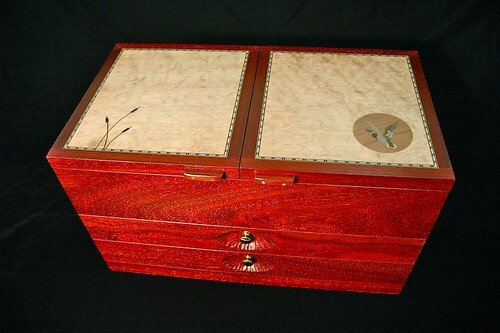 Padauk, Quilted Maple, Leather, Solid Brass. Click HERE for a complete blog containing over 100 photos of the building process. Ever since I posted the original Gunsmith Box on my website, it has been very popular. I get emails inquiring about price, etc., at least once a week. And as expected most of them don’t email me back once they hear the price. And once in a while I get a request for one of these boxes NOW… “my dads birthday is next week” etc. Well a few months ago I finally had someone from Texas who understood what goes into a custom project like this, was willing to wait, and agreed to my price. This represents my FIRST ONLINE SALE!!! The agreement was that I would have it shipped to her by Christmas for her husband’s gift. I decided to take the opportunity to make a miniature production run, and made three of these boxes at once. That way I would have two in “stock” if anybody needs one right away. The first got sent to Texas and the other two are currently on consignment at a local firearms dealer. 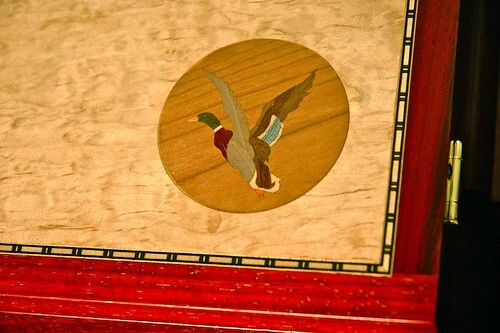 The photos in the gallery (above) show one of the “stock” boxes, which features a Mallard duck and some reeds inlayed into the top. My client in Texas requested a monogram letter “C” on the lid for her husband’s box. The photos of that box are shown in the blog. And the box is wonderful. Wow Blake, this is absolutely beautiful! A work of art and I am sure that you will sell the others to someone who truly appreciates this level of fine craftsmanship. 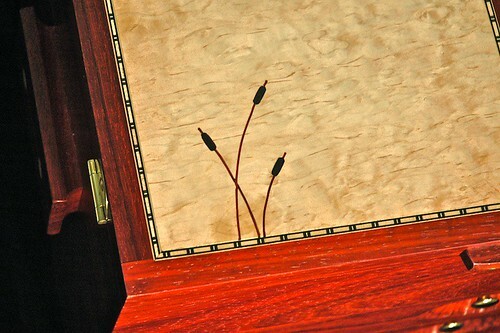 I love the details of the carving around the pulls, the banding inlay and the reeds and ducks, just fantastic! Congrats on the sale. I am sure the others will not last long on the shelf. great work. smart idea doing more than 1 at a time. The Padauk has a wonderful colour – do you know of any way of stopping it changing to chocolate brown over time ? Whoowhee, I like! And the shotgun comes with it, Right? That is n-i-c-e. Extraordinary. Fantastic work, don’t know what else to say really. Also big thanks for the photos of your process. Always loving those. Congratulations on the online sale and good luck for the other boxes. It seems people are the same all over though. Not realizing the work behind it, or wanting things in a week or whatever else that one can only shake his head at. Such fine work you have done there. It will look wonderful for a collector of guns, to display his favorite. Beautiful, well executed craftsmanship! I really like this idea! Congrats on the sale. Blake: congratulations on your sale. As always, just exquisite. We’ve come to expect nothing but perfection from you! Thanks for posting. Congrats on the sale!! Why don’t you post the prices on your site? I hae seen a lot of shooting boxes. Those are a bit higher quality matericlas than most and a little different design. As always your work is Awesome. Excellent craftsmanship. I love guns and I love wood. What an incredible attention to detail. The top is perfectly suited. The gouged drawer pull scallops are the icing on the cake. I absolutely love this piece.